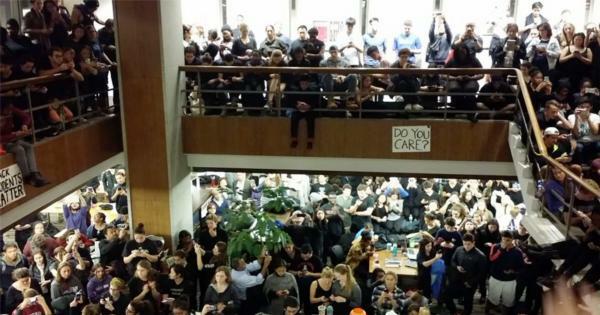 Amherst College is the next university in line where students are now demanding that free speech be banned or they will stage “civil disobedience.” They want the president of the college to punish and block students from expressing support for “free speech.” These demands were issued in support of the “Stand with Mizzou” movement. This is the same group where a professor called for muscle to remove and silence a reporter. The group at Amherst calls themselves ‘Amherst Uprising.’ They handed their demands to President Biddy Martin following a “sit in” which took place yesterday. The list of demands was subsequently published by the Amherst Soul website. Unless action is initiated within 24-48 hours, the students warn they, “will organize and respond in a radical manner, through civil disobedience.” One of the demands is that, “President Martin must issue a statement to the Amherst College community at large that states we do not tolerate the actions of student(s) who posted the “All Lives Matter” posters, and the “Free Speech” posters that stated that “in memoriam of the true victim of the Missouri Protests: Free Speech.” Let me translate… if you don’t agree with what we say and think, then shut up and go away. If it goes against the narrative being pushed by ‘Amherst Uprising,’ it will not be tolerated. Students at Amherst College are demanding that the school’s president accede to a list of demands that would effectively eliminate free speech on campus. The ultimatum grew out of a sit-in held earlier in the day as part of the “Stand with Mizzou” movement, during which members of a variety of student organizations on campus collaborated to identify the actions they believe must be taken in response to the “legacy of oppression” at Amherst, notably through the creation of “safe spaces” and the criminalization of “offensive” sentiments. More specifically, they want President Martin to denounce the actions of students who displayed “All Lives Matter” and “Free Speech” posters, and to warn the student body that in the future, “racially insensitive” speech would merit disciplinary action. Not content merely to purge the school of opinions with which they disagree, the students also demand that they be given time off from class and that the school’s mascot be expunged. Regarding the school’s mascot, the students want Martin to release a statement by Friday at 5:00 p.m. “that condemns the inherently racist nature of the unofficial mascot, the Lord Jeff,” and to follow up by encouraging the removal of all related imagery from campus. Lord Jeff is a reference to Amherst’s namesake, British Field Marshal Jeffery Amherst, who some historians believe encouraged the distribution of smallpox-infected blankets to Native Americans with whom the British were fighting during the French and Indian War. After the list of demands concludes, the students note that they will require further, as-yet unspecified, action from the administration, as well. Campus Reform is currently awaiting comment from Amherst on President Martin’s response to the students’ demands, and will update this story once the statement has been provided. These same thugs are demanding they be given time off from class and that the school get rid of their mascot. The list includes a demand for President Martin to condemn “the inherently racist nature of the unofficial mascot, the Lord Jeff.” Students assert that Lord Jeff – a representation of British Field Marshal Jeffery Amherst – is a symbol of how smallpox-infected blankets were given to Native Americans during the Siege of Fort Pitt, an incident for which there is no historical evidence. Another outrageous demand is that the college issue an official apology to “injustices including but not limited to our institutional legacy of white supremacy, colonialism, anti-black racism, anti-Latinx [sic] racism, anti-Native American racism, anti-Native/indigenous racism, anti-Asian racism, anti-Middle Eastern racism, heterosexism, cis-sexism, xenophobia, anti-Semitism, ableism, mental health stigma, and classism.” They should have just thrown in the kitchen sink. That’s coming I’m sure. This is an attempt to use race to justify fascism. They want the Constitution shredded and done away with. This is now spreading from campus to campus and behind it you will find communists, Barack Obama, Valerie Jarrett and that old spider, George Soros.